The RC-10 Wired Remote Control for and DR-100mkII from Tascam is a compact wired remote that allows you to control the functions of the DR-40 or DR-100mkII handheld digital audio recorders. Box Dimensions (LxWxH) 6.4 x 4.1 x 2.0"
RC-10 Wired Remote Control for DR-40 and DR-100mkII is rated 4.1 out of 5 by 17. 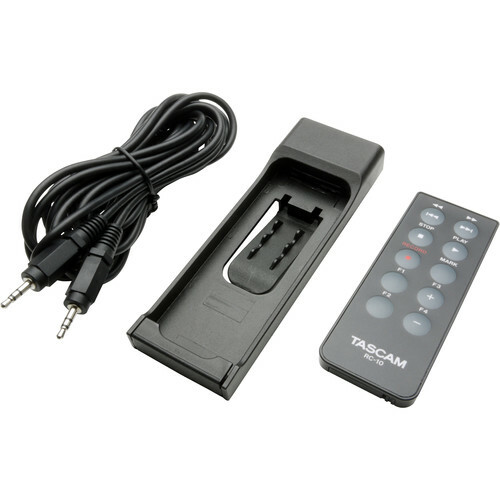 Rated 5 out of 5 by Eyesinthesky from Automated Remote I specifically purchased the Tascam recorders because of the wired remote. I thought I would automate turning on an off the recorder along with my video set up. However, the RC-10 uses this SC73P1601 chip that somewhat complicated things. I still managed to hack the remote and pins 8 and 13 of the chip are used for the 'record' button. All the buttons contacts needed can be easily accessed on the circuit board however I didn't bother with the other buttons. Its been tested and now the recorder starts and pauses recording along with my video camera that it provides sound to. Rated 3 out of 5 by Little Sam from Should be included with the recorder Works as expected, needs more functionality. Start, stop, play, record & volume. That's it, nothing fancy. The device is a universal I/R remote. Tascam designed a special caddy for this thing to plug and play with the recorder. They could have done better. For the price of one of their recorders this cheaply made remote should be included with the unit. But what are you gonna do? Rated 4 out of 5 by William from Simple, functional- but battery... I'm generally very pleased with this unit- light, small, well built, reliable AS LONG AS THE BATTERY is reliable. Unlike the remote for Zoom recorders, it's necessary to monitor the battery for leakage and it's the usual 2-hand process for loading it; I don't like this feature. There is a provision for operation without the battery as stated in the instructions, and I intend to investigate this possibility further. Rated 4 out of 5 by James from RC-10 remote for DR 40 This basic remote is a nice accessory for the DR 40. It's nice being able to set the recorder up on the other side of the mixer, and still have all of the basic controls at your fingertips. Just another one of the cool accessories that tascam should have put in a nice affordable kit to offer their customers! Rated 5 out of 5 by MaxOshkosh from RC-10 makes DR-40 even better. Nice to be able to start and stop recording without touching the DR-40. Only negative thing I can think of is that it uses a battery that will eventually need to be replaced. Rated 2 out of 5 by Tressa from Dead battery out of the box This is a generic remote (I agree it should have come standard with the recorder) and Im sure it works fine but it came with a dead battery right out of the box. Rated 5 out of 5 by Rusty from A great solution The problem with digital recorders is the handling noise when fumbling for the record button. This takes care of that problem. Will this remote control work with the dr-44wl? Asked by: Jay C E.
Jay C E,KB is correct. It cannot be used with the DR-44WL.Thank you for your interest in TASCAM products. is it compatible with 60d? Asked by: Pablo Esteban D.
Answered by: Steven B. E.
Can the remote be used wirelessly with the DR60? The RC-10 cannot be used as a wireless remote control with the DR-60D.See p.90 in the DR-60D Owner's Manual.Thank you for your interest in TASCAM products. is this suitable for Tascam DR-70D ? I do not have any personal knowledge, but the Tascam website says there are two remotes that work and the RC-10 is one of them. Madeleine B,Yes it can.See p.46 in the DR-100mkIII Reference Manual available here:&lt;a href= http://www.tascam.com/product/DR-100mkIII/downloads/ target= _blank &gt;http://www.tascam.com/product/DR-100mkIII/downloads/&lt;/a&gt;Thank you for your interest in TASCAM products. Is there any indication on the remote, or any audible indication to let you know when you switch from recording standby into record mode on the dr-40? No auditory signal. Watch the record button on the DR-40.